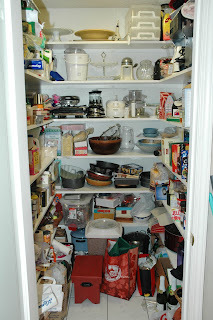 This is a photo of our pantry. You can see that it is jam packed with food and food-related appliances. It's also a walk-in pantry which is debatably the best feature of our house. So...what's in your pantry? Is it a cupboard? A shelf? How do you store your food and your appliances? We have an open pantry, and because of people can see it and also due to a similar moth incident, I keep it fairly well-organized and VERY well contained in lots of mason jars and Tupperware. LOVE the Container Store for moth protection solutions. Only food goes in our pantry, and there's not even enough room for all of it. Appliances get free reign over the rest of the kitchen. Yikes, I haven't had experience with pantry moths and knock-on-wood, we haven't had pests in this house. You can see that I aspire to having organized spices too Martha, but alas, it's merely an aspiration. Our spices are loosely grouped by name- A-L on the top shelf and M-Z but not in rigid order. Our pantry is the site of a cartoon comedy over time as Justin swoops in and organizes everything and slowly, over time I create the chaos that you see in this photo. Perhaps it's just an example of the second law of thermodynamics: that entropy is always increasing. I just have a lot of cabinets in my little apartment, and one cabinet is completely filled with cookbooks and cooking magazines. I would love to have an actually pantry someday! In our old house, we had a full hallway closet. In our new house, we have cupboards with pull out slide drawers. It's great. So just wondering but what's the craziest thing in your pantry right now? We have wheat-free dog treats in ours for our gluten-free dog. The pantry in my house is open . It's a set of floor to ceiling shelving that is packed with food and other odds and ends. Staples include white and wheat flour, sugars (brown and white) and vanilla. Currently most of my food items are not too exotic. I do have quite the variety of dried beans (garbanzo, red, pinto, red lentils, brown lentils, black (beluga?) lentils...) I also have a variety of dried chiles that I am dying to use but haven't had the guts to yet. That said, I have a mole recipe that I am hoping to try soon. Anyone want to try my creation? ah. lucky you. out appliances are in cupboards or on the counter. food is also in cupboards, in the freezers (we have a chest freezer, too), or on shelves in the garage.